While a lot of people watch TV or YouTube or spend their downtime resting or playing, I find that I can be highly entertained by surfing the various crowdfunding sites that have popped up on the Internet over the past few years. For most of my 33-year career, when entrepreneurs wanted to start a new business or create a new product, they had to go to venture capitalists, funding angels, banks, or in some cases even mortgage their houses to start up their businesses. Although this has been effective for many, thousands of others who had product ideas could not muster up the funding needed, and many products or service ideas died before they ever even had a chance to be created. Then a few years back, a new source for startup funding popped up: crowdfunding. At its core, a crowdfunding site serves as a kind of clearing house for people with new product ideas that span everything from gadgets to games to books to movies and many more projects for which a person needs funding to bring an idea to life. One of the leading sites is Kickstarter, a service that got major public attention when it was used to crowdfund the Pebble smartwatch. 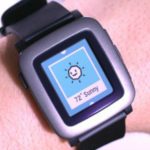 Pebble Technology launched a Kickstarter campaign on April 11, 2012 with an initial fundraising target of $100,000. Backers spending $115 would receive a Pebble when they became available ($99 for the first 200), effectively pre-ordering the $150 Pebble at a discounted price. Within two hours of going live, the project had met the $100,000 goal, and within six days, the project had become the most funded project in the history of Kickstarter, raising over $4.7 million with 30 days left in the campaign. On May 10, 2012, Pebble Technology announced they were limiting the number of pre-orders. On May 18, 2012, funding closed with $10,266,844 pledged by 68,928 people. I wanted a good smartwatch, so when I saw it was live, I paid my $115 and was lucky enough to be in one of the first groups to receive the Pebble when it shipped. Since the Pebble started shipping, dozens of other smartwatches have been announced. Kickstarter and Pebble will always be seen by many as ground-zero for the smartwatch market — a market many believe will become a very big segment in the emerging wearable computing arena. I also like perusing Indiegogo, another crowdfunding site, and Quirky, a site for crowdsourced product ideas. The folks from Mashable listed some other sites that do crowdfunding and are worth checking out. Since my first backing of a product through Kickstarter, I have found at least a dozen other products that I wanted from various crowdfunding sites, and I continue to look for cool new things that are of interest to me. I also am highly interested in products that not only get major attention but that also get funded fast, since they often represent a product that could impact the future of the product category they represent. This was very true with the Pebble smartwatch: The short time it took the watch to reach its funding success suggested to us researchers that the Pebble struck a nerve with the public. The smartwatch category could potentially be big. The National Crowdfunding Association of Canada (NCFA Canada) is a cross-Canada crowdfunding hub providing education, advocacy and networking opportunities in the rapidly evolving crowdfunding industry. NCFA Canada is a community-based, membership-driven entity that was formed at the grass roots level to fill a national need in the market place. Join our growing network of industry stakeholders, fundraisers and investors. Increase your organization’s profile and gain access to a dynamic group of industry front runners. Learn more About Us |Prezi or contact us at casano@ncfacanada.org.